Chatting with Jennifer Runyon on "The Haunted Chronicles" Friday, November 30, 8PM on Paramaniaradio.com! Chatting with Jennifer Runyon, “The Haunted Chronicles” Friday, November 30 at 8PM EST! Tune in to Paramaniaradio.com! 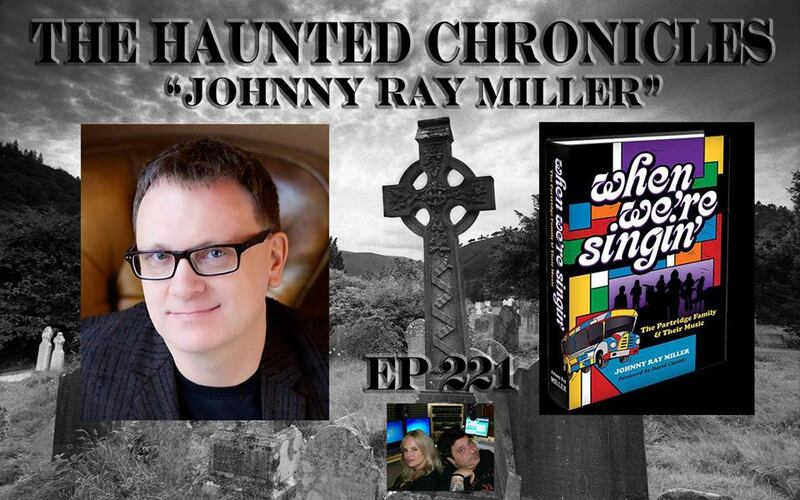 I’ll be chatting with Jennifer Runyon about WHEN WE’RE SINGIN’ this Friday, November 30, 2018 on her show “The Haunted Chronicles” airing on Paramaniaradio.com. So how do the “The Haunted Chronicles” and “The Partridge Family” go together? When I met Jennifer last summer, she was shocked to find out I had never seen “Ghostbusters.” Let the jokes begin, right? So she challenged me to come on her show and take a quiz after I watch the movie. This Friday I’ll take my quiz! How does “The Partridge Family” fit into this? Well….she picked up a copy of my book, having been a fan of the Partridge Family music, and she loved it. She has plugged the book on both her shows, “The In Crowd” and “The Haunted Chronicles” several times! Thanks a million times ten million, Jennifer!! Partridge Family/David Cassidy Musical Tribute, tonight, WBWC "Island Time Radio"! Returning to THE HOLLYWOOD SHOW April 27, 29, 2018! Excited to announce that WHEN WE'RE SINGIN' will have a table again this weekend at THE HOLLYWOOD SHOW. Please stop by if you are free! Bobby Hart will be there (songwriter, Partridge Family, music producer, Monkees) and if luck goes our way, we will have our table right next to his! Beginning February 2018--We Now Take PayPal! Many of you have asked about using PayPal to purchase the book: Letting everyone know that as of today, When We're Singin' can be purchased here through the website using PayPal for those who prefer that method of Payment. We also accept Visa, MC, Discover and American Express. Thanks to all those who have inquired! Book Signing, October 8, Foxburg PA! Interview with Stan Turner, KLBB, Extended Due to Listener Interest! Link Attached! The interview with Stan Turner at KLBB went so well yesterday they extended it to a full hour because listeners were calling in with so many questions! It was clear that Stan loved The Partridge Family and had great respect for the groundbreaking impact the show and the music had on 70s pop culture. Here's the link! Let me know what you think! :) Check out the site, too at KLBBRadio.com! THE BUS TOUR - A SCHEDULE OF BOOK SIGNINGS! Ready for the bus tour? Here is a list of locations and dates for upcoming Author events and book signings! The bus ticket is free! Come along for the ride!! MAY 6, Muggswigz Coffee and Tea Co., Portage Lakes, 3452 Manchester Rd, Akron, OH 44319, In-store book signing 10AM to 2PM. FIRST BOOK SINGING with HALF PRICE BOOKS, Saturday, April 22, Mayfield Heights OH! I hope to see some of you from the Cleveland/Akron/Canton area this coming Saturday, April 22! It will be my first book signing with HALF PRICE BOOKS, one of my favorite book stores! They have all kinds of things at this store, from books to CD's, to DVDs and vinyl! I'll be signing books from 1-3PM. Half Price Books, 1607 Golden Gate Plaza, Mayfield Heights, OH 44124. Feature Story in Canton Repository! Book Signings to follow! The Canton Repository featured an article and photo spread promoting "When We're Singin'" yesterday in the April 13th issue, placing the Partridge Family on the cover of the entertainment section, the Ticket! Great to see the Partridge Family on covers again, isn't it?! Book signings with the author will follow, beginning tomorrow, Saturday April 15th at Karma Café, 4339 Dressler Road, NW,Canton, OH 44718 from 10AM - 2PM. Another book signing will follow again Tuesday, April 18 at the Karma Café-- same Partridge-Time Same Partridge-Location! Books are also available for purchase NOW at Karma Café! See you there! See the electronic version, with different photos! Danny Tweets Again! "Come On Get Happy"
Hey Gang! Danny's on a roll! His Latest tweet: "Brought my lunch to work in this today. What the hell? Come on Get Happy!" Celebrating a TV and Music legacy...Spread the word..WhenWereSingin.com! Follow Danny on Twitter @theDoochMan. Follow David Cassidy on Twitter @DavidbCassidy! DANNY BONADUCE Tweets support today for WHEN WE'RE SINGIN'!! DANNY BONADUCE tweeted this pic, along with a great comment about the book! Read his tweet: "Just received my copy of a great new book about The Partridge Family. It's 467 pages. I had no idea we were this important." FOLLOW US ON TWITTER, EVERYONE! TWEET, RE-TWEET AND SPREAD THE NEWS!!! :) Come on get REALLY happy!!! Lisa Forster, Brian's wife, has been struck with an aggressive cancer. A good friend of theirs has begun a "Gofundme" campaign to help with expenses. Brian was (and is) a HUGE supporter of "When We're Singin' " and it saddens me deeply to hear of this. Please do whatever you can to help. The family is staying strong and optimistic. Please pass this information and link on to all the PF fans and message boards to help get the word out and rally support. Thanks all. Hey All! HAPPY NEW YEAR! And we're off and running...The next book signing for "When We're Singin' " will be held this weekend, Saturday, January 7, from 10AM to 2PM at Branch Street Coffee in Boardman! Hope to see some of you from the Youngstown and Columbiana County area! :) Exact Address: BRANCH STREET COFFEE ROASTERS, 1393 Boardman-Canfield Road, Boardman, OH, 44512. OUR FIRST BOOK SIGNING--PEABERRY'S CAFE! Our very first book signing is scheduled at PEABERRY'S CAFE next Saturday! Hey Ohio/PA friends...hope to see some of you at Peaberry's in Canfield, OH, next Saturday, December 10, from 10AM-2PM. Full address: 4350 Boardman-Canfield Road, Canfield, OH 44406! 5, 4, 3, 2....We're Off To Print! Release Date set! After a long week of Kristina, Donna and I working nearly round the clock, the book went to print earlier today! I'd like to thank all of you for your extraordinary patience. I, too, never dreamed how much time it would take for this project to complete, but I can tell you this: It is because of YOU, the fans, that this book has finally made it's way to reality. Because of YOU, the book was controlled by a group of professionals who care enough to release the best possible book on The Partridge Family and their music, filled with the kinds of detailed information fans have wanted for years and years. Check out the final artwork for the book cover! The 64 page color photo section is also another extraordinary accomplishment. Rarely does a book like this see a full color section in the middle, let alone 64 pages! But YOU wanted it, and YOU funded it and that is testament to the passion we all share for the music of The Partridge Family. I am thankful that avenues such as Kickstarter exist today, making it possible for all of us to speak, and to act on what we want. There is no publisher on the planet who would have released a book as thorough and elaborate as this, and it all happened because of you. In the coming days and weeks, I will be here, telling you more about the book and its contents. I thank you again, wholeheartedly, for your support, your patience, and most of all, your undying love for all things Partridge! On December 9, 2016, "When We're Singin' - The Partridge Family & Their Music" will be officially released! The book (originally planned for 410 pages) is a whopping 504 pages with the 64-page color photo section taking it to a grand total of 568 pages! "When We're Singin'" is a LIMITED EDITION hard back, available exclusively through the website, WhenWereSingin.com. "You can pre-order When We're Singin'" in time for Christmas by going to the link on the website now! Be sure to sign up for the "daily blog" to receive updates that will come directly to your email inbox! I will be back to share more information and exciting details during the days and weeks to come! Hop on the bus, everyone! It's time to move on to the next stop! Proof for Text Body is in! Wanted to let you all know that Kristina has finished the first proof for layout of the book body. I received the proof and I have already gone through it and passed it on to Donna. (copy editor). Once Donna is finished, it will then return back to Kristina. She will make all edits/corrections and then provide us with a second proof to look over. If all goes well, at that point, it goes to print. For fun, check out the picture of Kristina working on the book at her office! I will be back with all of you as I share the step by step process of these final stages! By the way, happy anniversary, all of you! (Did you know yesterday was the debut of The Partridge Family, 46 years ago?) Yep...we're THAT old! Just a quick update for you. The text and final artwork for the book cover is currently in the layout stages. Kristina Danklef of Sourballpython Studios (Sourballpython.com) will be taking the book through the final stages of layout, including the final design for the book cover. Kristina is from Salem, Ohio, and has a long background in graphic art. She recently completed work on several books, including "Wisdom from the Woods, Seasons," and she has taken on our Partridge Family book with tremendous excitement. First thing on deck is the book cover, and she will be sending me proofs to look at in the coming days. I am as excited as you are, and as soon as I get the first proof, I'll be back with all of you to fill you in! For now...we countdown to NINE! Celebrating the 45th Anniversary Today! We officially declare the next 7 days Partridge Family week! Come join us for some retro-'70s fun as we celebrate the 45th anniversary of The Partridge Family! On September 25, 1970 we met the Partridges on ABC Friday nights at 8:30 pm. David Cassidy burst out of the gate as an international superstar. "I Think I Love You" was already climbing the charts when the show premiered, moving faster and faster towards the No. 1 position! "When We're Singin'" Available for Pre-Order NOW! Hey gang! It's official! "When We're Singin' - The Partridge Family and their Music" is now available for pre-order ONLY through this site! The cost of the book is $29.99 and you can pre-order it by going to the new link on the site, PRE-ORDER THE BOOK. I hope everyone is enjoying their summer! We will have more news and updates on the book's progress in the coming weeks! Watch for regular blog postings as we go forward. If you haven't already done so, please sign up for the daily BLOG and you will receive the blogs directly to your email! The Partridge Family and their famous Mondrian-inspired bus!